Bailey ‘BadBoy’ Sugden came back from Blyth this weekend with his professional record intact after securing another win by a unanimous decision on Saturday 2 July. The 18 year-old K1 star was one of three Suggy’s Gym fighters on the card of The Home Show at Blyth Sports Centre in Northumberland, the biggest event of its kind in the north east for several years. First up for Suggy’s Gym was Megan Williams, who was off to a quick start against a tall and strong opponent in KO Kickboxing’s Charlotte Thompson. After taking control of a very competitive opening round, 15 year-old Megan had it tough in the second, caught with low kicks and resting on the ropes. But the action was back and forth in the third, leaving the capacity crowd uncertain which fighter’s hand would be raised after the final bell and both corners agreeing that the announcement of a draw was probably the best decision. Heading up the semi-professional card, local favourite Kevin Smiles took on Suggy’s Gym’s Celio Wagner in what was a barnstormer of a fight under K1 rules. Standing at 6’ 5”, Kevin was keen to make use of his reach but his efforts in the first round were countered by the speed and movement of his Newark opponent. With both men already going for the finish, there were several moments when the fight looked likely to be stopped but there was no doubt in the Suggy’s Gym corner that this was a winning round for Celio. The home crowd went wild as Kevin came out all guns blazing for the second, landing a kick which took his opponent momentarily to the floor. Although Celio appeared more unbalanced and tired than hurt, the ref gave an eight count to the Suggy’s Gym fighter. Following an unbelievably exciting third round which again had the crowd on its feet, the decision went to home favourite Kevin ‘Stretch’ Smiles, after what Celio’s corner described as a good learning fight which they are keen to revisit. 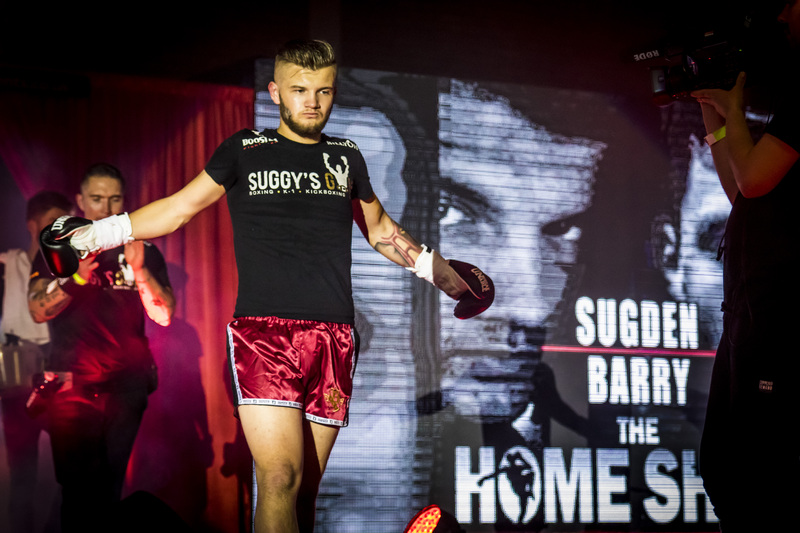 As the show moved on to the professionals on the main card, the Newark supporters were pinning all of their hopes on Bailey Sugden and as always BadBoy did not disappoint. Back at his usual fighting weight of 65kg max, the Suggy’s Gym professional went head to head with Robert Barry from Newcastle’s Manor Thaiboxing. Neither man wasted any time getting straight to it, Bailey with his strong boxing skills and his opponent with lightning quick kicks. After a very explosive and close first round just edged by Bailey, some adjustments were made to the game plan. Bailey responded by taking all instructions from his corner on board, which resulted mainly in his opponent reeling backwards. 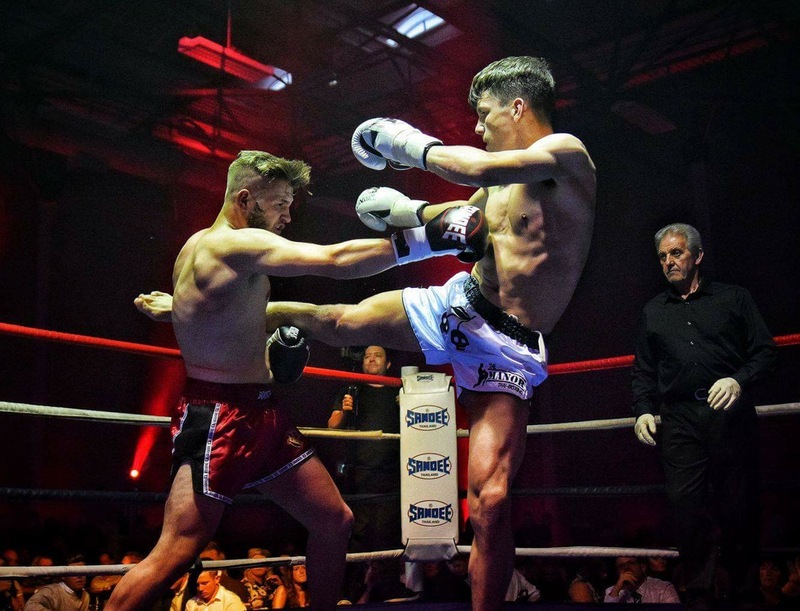 In the third and final round, the Suggys Gym fighter really took control, his numbered combos landing all attacks with kicks and knees and timing the front kick perfectly while Robert loaded up the round kick. Bailey was back with a vengeance, taking the victory by a unanimous decision. “This was a very well run show with some of the best K1 fighters on the international circuit featured on the main card,” said Suggy’s Gym head coach Dean Sugden. “With another win under his belt, Bailey’s ability to adapt to changes in the game plan and the skills he demonstrated throughout the fight against a very sharp and on point opponent were deservedly praised by his own supporters, the commentators and the fight fans in the crowd alike. “We’ve already asked for a re-match between Celio and Kevin and are just waiting for confirmation that this battle of the giants will be revisited on our next Newark event, The Road To Glory 3, on Saturday 1 October. And we’d love to see Megan and Charlotte fight each other again too at some point. “But for now, our focus is all on Chad’s next boxing bout on Sunday 24 July and on Bailey’s outing on Saturday 6 August, when he’s up against another unbeaten opponent in Walsall.